Thiruneermalai is one of the 108 divyadesams situated on the Chennai suburbs, about 4 miles (7 kms)from the Pallavaram railway station which is about 7km from Chennai. Thiruneermalai Temple is on a small hillock and is said to be dated around 2000 years old according to scriptures found in the temple. This divya desam is also called as "Thoyagiri Kshetram" and also as "Thothadri". Thoya means "Water" and Adhiri means "Mountain" (malai). 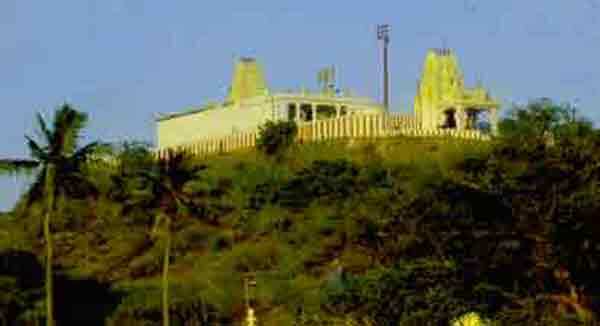 Since the hill was once surrounded by water, this place was named as "Thiru Neermalai". It is said that once saint Thirumangai Alwar came here to have the dharshan of the Perumal. During that time, the hill was fully surrounded by water and he waited for six months to worship the Lord. After all the water drained, he went up the hill and worshipped the Perumal. The Lord here shows his 4 sevas - Nindra(standing), Iruntha(sitting), Kidantha(lying) and Nadantha(striding) Thirukkolmas (poses). At the adivaram (bottom) you can have the darshan of Neervannan (Neelamukilvannan) along with thayar Animamalar mangai. Prathyaksham (seva) for Thondaimaan, Brighu Munivar and Maarkandeyar. Climbing the small hillock's 200 or so steps you can see the other three perumal sannidhis. Sage Valmiki is said to have worshipped Aranganathan, Narasimar, Thiruvikraman here. After worshipping all the 3 sevas, he came down from the mountain to worship Lord Rama. Knowing this Lord Ranganathan gave darshan as Sri Ramar and Lakshmi Piratti as Seetha and Aadisesha as Lakshmana and Sangu and Chakram as Baratha Chatrukanan. Lord Vigneshwar as Sugreev and Garudan as Hanuman. According to the scriptures in the temple, it is said that worshipping here is equivalant to have visited four divya desams Thirunaraiyoor,Thiruvaali,Thirukudanthai and Thirukovilur. Here in this temple,there is a old peepal tree. Lord Ganesha, known here as Dhoomakethu Ganapathi, is seen along with Sapthakaanika's under this tree. Santhaana homam (homam performed praying for child), milk abhishekam on chathruthi day by the devotees. Dhoomam means "Rahu". If you worship this Ganapathi during rahu kaalam, it is believed that all the dosha's will be removed by praying to Lord Ganesha here. The Moolavar Ranganathan is in lying posture(kidanthan), the Sayana kolam is referred to as "Manicka Sayanam". He is lying on the Aadhiseshan under Ranga Vimaanam facing the south. The Moolavar ThiruVikraman is in striding posture(nadanthan), facing the east. The temple is revered by the verses of Thirumangai Alwar and Budhathalwar. The holy tank here is one in form but is said to comprise of four theerthams. The Mahamaga tank in Kumbakonam is believed to be a confluence of 19 theerthams. Similarly here, four theerthams Siddha, Swarna, Karunya and Ksheera theertham confluence in this holy tank. This place is 6 kms from the Pallavaram station which itself can be easily accessed by suburban trains and buses. Plenty of local buses, taxis , autos are available from Pallavaram bus stand. If you are driving, the roads are well laid and 6 kms away from the GST road and also via the outer ring road. Contact Sri Neer Vanna Perumal – Sri Ranganathar Temple, Tiruneermalai – 600 044, Phone +91- 44-2238 5484,98405 95374,94440 20820. Altitude: Sea level and the hill temple at around 300ft MSL.